Econ Tea, Wednesday at 4:30 p.m.
Here’s some more advice to potential majors — to all majors, in fact — come to the first Econ Tea of the fall term Wednesday, September 24 at 4:30 p.m. in Briggs 217. We will be welcoming our new faculty members, Hillary Caruthers and Jonathan Lhost. 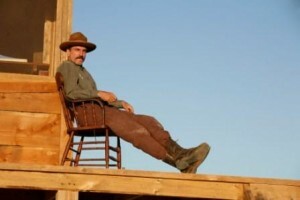 We will probably have some assortment of refreshments, depending on our department budget and prevailing market prices. Joseph Michael Newhard, “The Stock Market Speaks: How Dr. Alchian Learned to Build the Bomb,” Forthcoming in Journal of Corporate Finance. We knew they were developing this H-bomb, but we wanted to know, what’s in it? What’s the fissile material? Well there’s thorium, thallium, beryllium, and something else, and we asked Herman Kahn and he said, ‘Can’t tell you’… I said, ‘I’ll find out’, so I went down to the RAND library and had them get for me the US Government’s Dept. of Commerce Yearbook which has items on every industry by product, so I went through and looked up thorium, who makes it, looked up beryllium, who makes it, looked them all up, took me about 10 minutes to do it, and got them. There were about five companies, five of these things, and then I called Dean Witter… they had the names of the companies also making these things, ‘Look up for me the price of these companies… and here were these four or five stocks going like this, and then about, I think it was September, this was now around October, one of them started to go like that, from $2 to around $10, the rest were going like this, so I thought ‘Well, that’s interesting’… I wrote it up and distributed it around the social science group the next day. I got a phone call from the head of RAND calling me in, nice guy, knew him well, he said ‘Armen, we’ve got to suppress this’… I said ‘Yes, sir’, and I took it and put it away, and that was the first event study. Anyway, it made my reputation among a lot of the engineers at RAND. You can get an ungated version of the the paper here. As per usual, the availability of refreshments is subject to estimated demand and prevailing market prices. Econ Tea Monday — Pre-Registration Advising and Major Consultation… and, Look, the Pie! 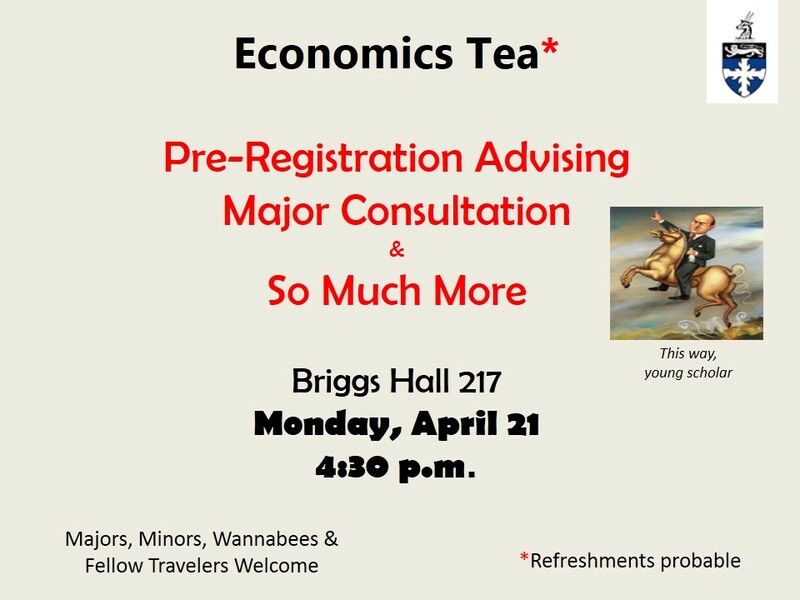 We will host an Economics Tea on Monday, April 21 at 4:30 in Briggs 217 to convene for lively discussion and delicious pie. Faculty will be available to discuss pre-registration and give advice to anyone interested in learning more about the department major. We will once again be offering various types of pie. For the Google-impaired amongst you, here is a link to the major and minor requirements. The core series sequence is Micro Theory (ECON 300), Econometrics (ECON 380), and Macro Theory (ECON 320). These are generally offered once per year, with ECON 300 in the fall, ECON 380 in the winter, and ECON 320 in the spring. We believe that taking these back-to-back-to-back is a good strategy. You need calculus (MATH 140 OR MATH 120 & MATH 130) in order to take Econ 300. You need calculus in order to take Introduction to Probability and Statistics (MATH 207). Math 207 is only offered in the fall term each year. You need MATH 207 and either ECON 300 or ECON 320 in order to take Econometrics (ECON 380). We recommend that you take MATH 207 in the fall and ECON 380 in the winter. The full schedule is right here. UPDATE: The talk is in Steitz 102. The first Economics Colloquium of the year is our own Professor Marty Finkler talking about some of his recent work on the U.S. employment situation. 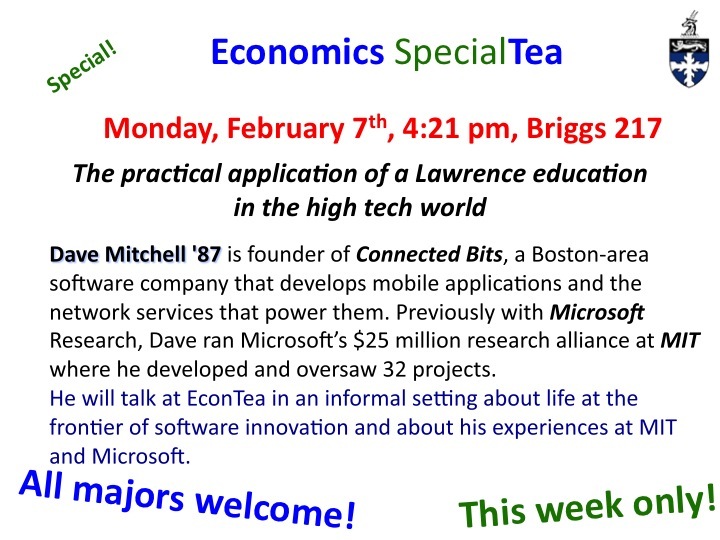 He will give a 30-40 minute talk, after which we will adjourn for Econ Tea in Briggs 217 at 5:15. Please join us for Professor Finkler’s talk, and to meet our visiting faculty, Satis Devkota and M. Taylor Rhodes. The economic recovery from the recession of December 2007 to June 2009 featured real GDP returning to its pre-recession level while employment continues to lag behind to its pre-recession level. One possible reason is that employment patterns contain both cyclical and structural components. In this paper, changes in the price of labor, unit labor costs, and the cost of equipment and software are studied as key structural components. Separate regressions with changes in employment as the dependent variable are performed for goods producing, service producing, and manufacturing sectors. In each case, explanatory power is increased with the inclusion of a representation of the cost of labor; thus, macroeconomic policy that seeks to stimulate employment growth should consider the effects of the chosen policy on the relative cost of labor and not just on aggregate demand. The now annual Economics Open House for prospective majors is coming Monday, April 8, at 4:30 in Briggs 217. The economics faculty will be on hand to discuss the once and future of the economics department, answer questions, and just generally provide a pleasant ambiance. We encourage current majors and minors to stop by and feast both on the complementary snacks and the delicious conversations that will undoubtedly spontaneously emerge. Tell your friends and see you there. 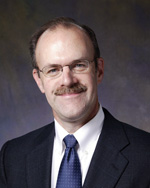 Thursday, you will have two opportunities to engage with Jim Lyon, Lawrence alum and First Vice President of the Federal Reserve Bank of Minneapolis. He will be discussing “Too Big to Fail” and the Dodd-Frank Act response at 9:00 in Money and Monetary Policy (Briggs 225). He also will chair a mock Federal Open Market Committee meeting in which students in the course will represent members of the Board of Governors and Presidents of the 12 district Federal Reserve Banks. You are welcome to join us for either part of the class. 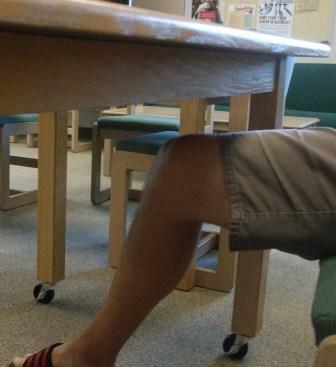 At 4:30, we will have an Econ Tea with Mr. Lyon as well. This will be an open and free-wheeling session for which the topic will be “Everything you always wanted to know about money and banking and ARE NOT afraid to ask.” Come for the discussion or just come for the cookies and tea. The year-end picnic, more affectionately known as the Econ-nic, is set for Thursday at 5 p.m. on Hiatt Patio. There will be pizza bread and soft drinks access to a water fountain for those who would like to dine with us. We will be robo-mailing you and circulating a sign up sheet over the next week. George Mason economist, and letter-to-the-editor writer extraordinaire, Don Boudreaux, has an opinion-editorial in the Christian Science Monitor explaining his distinction between public policies that are pro-business and those that are pro-market. Economists (especially the free-market variety) – concerned always to keep outputs of goods and services as high as possible – typically defend business against counter-productive government interference. We economists do so, however, not because we have special fondness for business. We do so because we understand that government interference in business often results in fewer goods and services for ordinary men and women – as consumers – to enjoy. The irony is that such policies – which really should be labeled “crony capitalist” – are often labeled “competitiveness” policies. Because these policies increase the profits of some domestic businesses, they are mistakenly believed to make the domestic economy more “competitive” when, in fact, they make it less so. This seems to me to be an important distinction. I try to convey to you all that no one hates competition more than business does. If you set up a profitable business, say, selling hot dogs on a street corner, the absolute last thing you want is a competitor to park her cart next to yours. 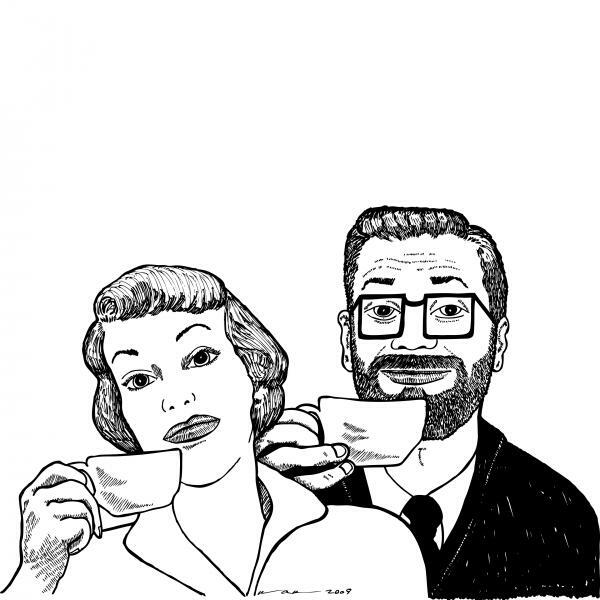 And, while we’re on the subject, don’t forget to join us for tea at 4:21 for Econ TeaBA. The departure of Professor Azzi leaves me the only economist on Briggs 2nd, and I will be departing shortly for the hills. 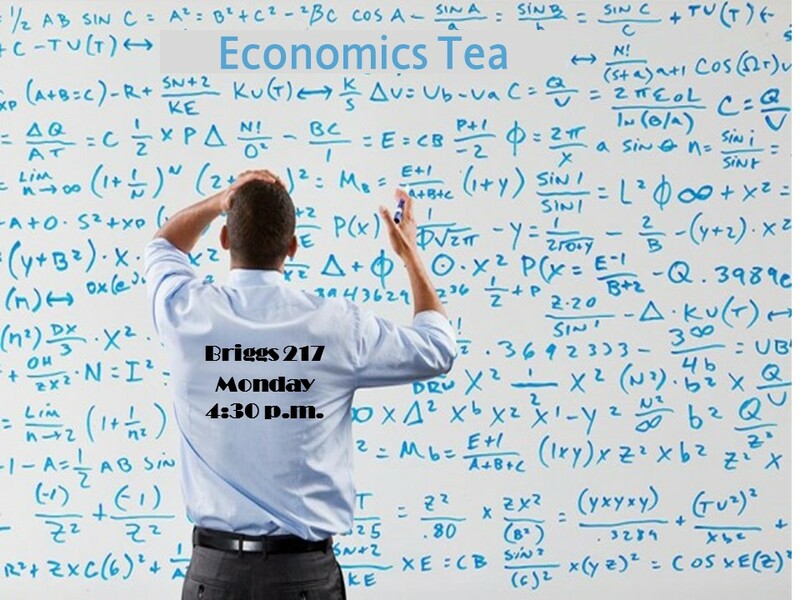 Hence, contrary to what it says on the campus calendar, there will be no Econ Tea today. We will see you next Monday at 4:21 p.m. sharp. We kick off the final week of classes with a holiday, perhaps an apt metaphor for where many of you have been mentally for the past week. The holiday preempts the usual slot for the Economics TeaBA, paving the way an afternoon barbecue for the missus and me. 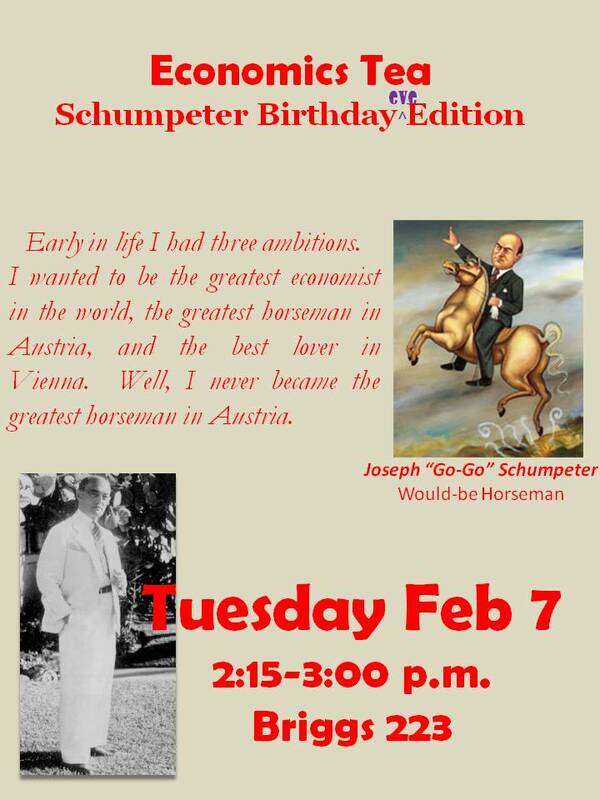 We get back to serious business in my courses Wednesday. In environmental economics (Econ 280), small groups will be reviewing the cost-benefit analysis of the Minerals and Management Services offshore leasing program. Then in the afternoon, the political economy of regulation course (Econ 240) will be going through some of the administrative regulations governing offshore drilling, truly a look at how the sausage is made. If you are interested, stop on in to see whether they’ve learned anything. So, I’m headed over to the parade. Hope to see you there. It’s time to get ready for the penultimate Economics TeaBA of the 2009-2010 season. As per usual, the fun starts at 4:15 Monday in Briggs 217. 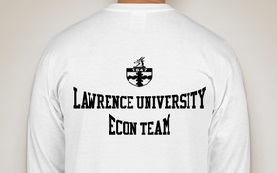 The Economics TeaBA came pretty much out of nowhere and has become a centerpiece of the economics co-curricular activities at Lawrence. Dozens of students have been treated to hot beverages, high-calorie snacks, along with both casual and serious discussions with the economics faculty and other esteemed attendees. 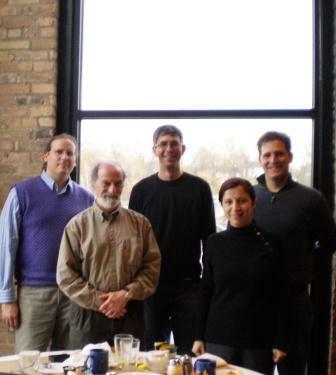 In the past few weeks, we’ve enjoyed the company of EPA Administrators, mathematics professors, professors emeriti (is that the plural of emeritus? ), and visiting economists /standup comedians. So, we never really know what the Economics TeaBA will hold. All I can say is that this week’s will be the penultimate experience. Or perhaps a delicious milkshake? After what is certain to be a grueling 240 exam, what better way to kick off a Monday night than a visit to the Economics TeaBA with economics faculty and students? Remember, it’s TeaBA because, unlike other disciplines, we don’t want to lock ourselves into an inefficient technology in the event that relative prices change. In fact, given the warm weather, it might be a good time to switch to Iced TeaBA. As always, the fun begins at 4:15 in Briggs 217. As we have just seen, there is a lot going on around Briggs second these days. We’ve got the attention of the University with the This is Lawrence video, there is the upcoming Chicago weekend, we are in the midst of class registration, and the Entertainment Industry Summit is on the horizon. That means there is no better time than now to join us for the Economics TeaBA in Briggs 217 at 4:15. You never know who’s going to show up. Last week we were joined by visiting Scarff professor and Povolny lecturer, George Wyeth, as well as comic genius and fellow Povolny lecturer, Yoram Bauman. 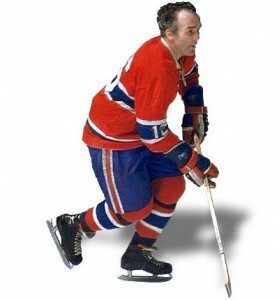 This week, perhaps it will be all-time hockey great, Henri Richard. Well, perhaps not, but it promises to be a good time. As ever, the menu is subject to the department income and changing relative prices. The excitement starts at 4:15 p.m. in Briggs 217.